A database of Wisconsin entrepreneurs and their skill sets. A statewide internship program matching college students with startups hungry for cheap-but-energetic talent. A series of meet-ups streamed over the Web. These were among the ideas floated Wednesday night at an event in Madison meant to bridge the state’s various startup communities. By the end of the session, some of the ideas were already being put into action. “We’re going to try to figure out how to strengthen the ties between these communities,” Niko Skievaski told the crowd before the session started. Skievaski is the co-founder of Madison coworking space 100state, one of the groups that organized the event with Startup Milwaukee, Madison-based Capital Entrepreneurs, and Madison’s Forward Technology Festival. 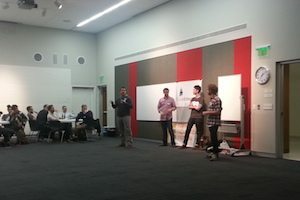 The goal of the discussion at the downtown Madison Public Library was to spur dialogue and collaboration among entrepreneurs in Milwaukee, Madison, and the state’s other startup communities, who currently operate in their respective bubbles without much interaction, Skievaski said. About 100 entrepreneurs, college students, government officials, and other stakeholders from Milwaukee, Madison, Beloit, Eau Claire, and Fort Atkinson participated on Wednesday. This was the second such event. In November, a group of Madison entrepreneurs took a bus to Milwaukee for a similar discussion at 96square, a downtown Milwaukee coworking space run by Startup Milwaukee. On Wednesday, Startup Milwaukee organized a bus ride for about 40 Milwaukee entrepreneurs to Madison. Attendees built off some of the ideas from the first event, brainstormed a few new ideas, and broke into small groups to figure out a plan to implement them. Within a couple hours, participants had created a LinkedIn group for attendees and all Wisconsin entrepreneurs; a Google Hangout group for online video discussions of topics like early stage financing and IT; and a prototype for a directory of Wisconsin entrepreneurs, which partly aims to connect startups seeking a contract graphic designer or software developer, for example, with people that have those skills. One attendee volunteered to oversee the logistics of creating a startup conference that could be part of the Forward Tech Fest or perhaps stand on its own. Wednesday’s event generated more well-developed ideas than the first, which encouraged Matt Cordio, Startup Milwaukee co-founder and executive chairman. Some of the ideas from the event will move forward. Others will sputter and die. That’s OK, Skievaski said in an interview. “The biggest benefit is they tried and know each other now,” Skievaski told me after the event. Skievaski thinks more cohesion between the Milwaukee and Madison startup communities could allow them to reach “critical mass” and compete with bigger startup hubs around the country in metrics like attracting institutional investments. But the two connecting events are a good start that will likely lead to more interaction, he said. “It’s already growing a little stronger,” Skievaski told me.